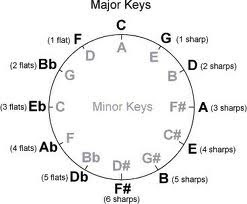 Quickly, tell me how many flats in an Eb Major Scale? Sorry, I didn’t mean to scare you like that. But it’s a good question, especially if you want to play in Eb, and one that is easily solved using my patented 5th Interval Finder and a handy tip known as Key Reversal. While traveling in Australia in 2011 I took a music lesson with John McMillan (thanks to Bosko) who shared with me his Key Reversal Method for memorizing the number of flats and/or sharps in each of the 12 keys. 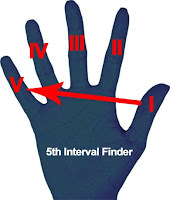 Using your 5th Interval Finder jot down the seven letter named notes we all know and love, one 5th interval apart, like John’s diagram below (C to G is a 5th interval apart etc.). 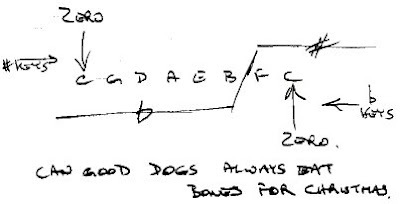 John used the acronym Can Good Dogs Always Eat Bones For Christmas to memorize the sequence. I would get a pen and paper and actually write the diagram out yourself counting a 5th at a time up the sharp keys as to better internalize their order. Now travel up the diagram from left to right. Start at zero (C) which has no sharps. G is one and has one sharp, D is two and has two sharps and so on. Start at the other end of the diagram, going right to left and you’ll be traveling down the flat keys. C at zero has no flats while F at one has one flat in its scale and so on. You can consult the Circle of 5ths to confirm your findings. Not all of us learn, process, memorize or internalize information in the same way. The key, so to speak, is to try every tool that is available and see which one works the best, for you. By the way, the answer is three flats in the Eb scale. I really want to thank you for this series!